Recently I announced that to my extreme excitement, I would be partnering up with The Stratford Apothecary to bring you monthly reviews and giveaways of their fantastic products! Well, this is my second month with them and I am happy to bring you yet another review and giveaway. I have a love for things that help my skin. In case you haven't noticed, this blog is full of products that are for your face, hands and skin in general. When you are a mom, you look forward to little things that make your life happier and more relaxed. Well, todays spotlighted product from The Stratford Apothecary is sure to make you one happy momma...I guarantee it! The Stratford Apothecary is a company that offers items for you, your home and your family. My favorite part about this company is that the products are grouped into different "destinations" featuring products that are themed to match the particular destination. Today's product comes from the Back to Home and Hearth category and it is VERY nice. For this review, I was sent the Cucumber, Apple & Rice Bran Homemade Facial Mask. This facial mask is very clean and refreshing as it contains ingredients such as Olive Oil, Cocoa Butter, Cucumber, Apple and Rice Bran. These ingredients make this mineral Facial Mask very enriching. Using this Homemade Facial Mask twice a week can help draw out deep-down dirt and impurities without drying and damaging your skin. I think that of all our skin, our faces probably take the hardest of beatings...and deserve the best of care. This Cucumber, Apple & Rice Bran Homemade Facial Mask is a greyish-white color and smells very organic. The texture is slightly grainy, but not like sand. You can really see the Rice Bran in the cream! I tried this Facial Mask last night before bed and it was VERY relaxing. It felt very cooling. I simply applied it to my face (avoiding my eyes and mouth) and then kept it on for 10 minutes. Then, while using a massage type of motion, I removed it with a warm, wet washcloth. My pores on my face get really dirty because of oily skin and the first thing I noticed after using this mask is that my pores were very clear. Also, my skin was noticably softer...which was nice. 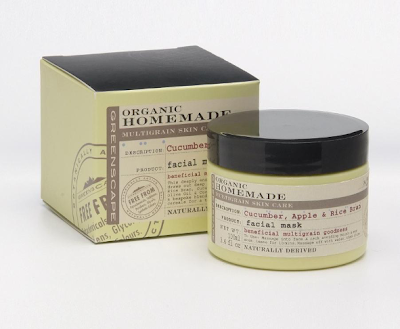 This Facial Mask retails at $8.97 per jar...very reasonable!!! So, in my opinion...this Cucumber, Apple & Rice Bran Facial Mask is wonderful! I love how my skin looked and felt after using it. This mask is soothing and cooling as well as very relaxing. I love how The Stratford Apothecary makes it sooo simple to indulge yourself without breaking the bank! I highly recommend this product to anyone looking to pamper themselves with something that is different, refreshing and organic. Visit The Stratford Apothecary and tell me which destination suits you the best and why! You do not have to be a blogger to enter, but you must have a valid email where you can be reached should you win. If you do not leave an email address, it must be where I can easily find it. This giveaway is open to US residents and will end 3/21 at 11:59 pm EST. The winner will be chosen using random.org and will be notified by email. The winner will have 48 hours to respond, or another winner will be selected. 5. Put my button on your blog, let me know where to find it (link and location). 5 entries, so 5 comments! Disclaimer: I received no monetary compensation for this post. I did receive a Cucumber, Apple & Rice Bran Homemade Facial Mask for review purposes. All quotes are from The Stratford Apothecary website and email. All thoughts and opinions are mine. Seaside Portugal because the scents sound so inviting. I'd love A Walk in the Country because nothing is quite as peaceful as a walk in the country!! On A Trip To The Tropics! Would love sunny weather at the moment! definitely on a trip to the tropics because I love tropical smells, mango, coconut, papaya, etc... for my home and lotions. what a great contest! I love a European tour because I think it would be a great getaway! thanks for hosting! The naturally European collection, all of the products look like things I would love! I went with the Country one because I love outdoors and then found out that line is free from PETROCHEMICALS, SULPHATES, GLYCOLS, PARABENS AND SYNTHETIC COLORS. A Walk in the Country sounds perfect for me! I love going for quiet country strolls- so relaxing. I would like a quiet stroll in the garden. WOW sounds nice right now. i like the tropics because it is hot. i think " a european tour"
Definitely Seaside Portugal because it sounds so delightful and peaceful. Sand Dollar Island suits me the best... Sounds like aome place far away that I'd like to go to . Trip to the Tropics - Love the weather! On a European tour because I have always loved European history. A Walk in the Country because it sounds so nice. A Quiet Stroll Through The Garden suits me best because I love flowers. I like a Garden Walk. I love floral scents. 2.Button on my blog. Top right. 3.2.Button on my blog. Top right. 4.Button on my blog. Top right. I tweeted about the giveaway at http://twitter.com/likwan/status/50040656936189952. 5.Button on my blog. Top right.